The Kaiser Family Foundation’s interactive map now allows users to compare what consumers in each county would pay in health insurance premiums after tax credits in 2020 under the Affordable Care Act vs. the House GOP replacement plan, the American Health Care Act. The maps include estimates by county for current ACA marketplace enrollees at age 27, 40, or 60 with an annual income of $20,000, $30,000, $40,000, $50,000, $75,000, or $100,000. 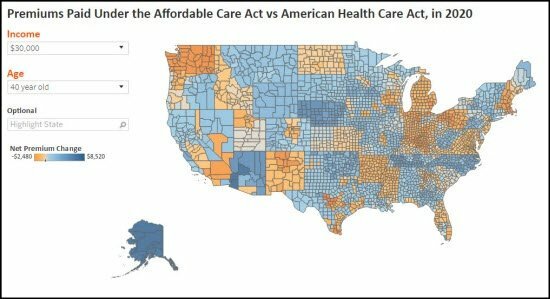 In addition to premium and tax credit estimates, the maps show the share of an individual’s income they’d pay for health insurance premiums, and the dollar and percentage difference in premiums under the ACA vs. the House GOP’s AHCA. Generally, people who are older, lower-income, or live in high-premium areas (like Alaska and Arizona) receive less financial assistance under the AHCA. Additionally, older people would have higher starting premiums under the AHCA and would therefore pay higher premiums. Because younger people with higher-incomes and living in lower-cost areas would receive more financial assistance and would have lower starting premiums on average, they would pay less on average. Note: This analysis does not take into account changes the House made on March 20 that would potentially allow for larger tax credits under the AHCA for people over age 50; it is not yet clear whether and how those funds would be allocated to tax credits. The map also does not include cost-sharing assistance under the ACA that lowers deductibles and copayments for low-income marketplace enrollees.